Height: 40 in. Width: 27 in. Depth: 31 in. • On/off end of cycle signal. 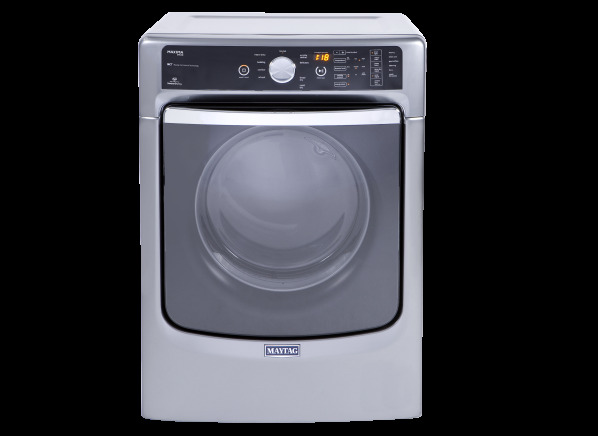 The Maytag Maxima MED8100DC is part of the Clothes dryer test program at Consumer Reports. In our lab tests, Clothes dryer models like the Maxima MED8100DC are rated on multiple criteria, such as those listed below. Drying performance: This score combines performance on three types of laundry loads of different sizes and fabric mixes: A 12-lb. load, predominantly cotton, representing a family's large weekly load; an 8-lb. load of cotton/polyester blend clothing; and a 3-lb. load of synthetic delicates, women's pajamas, nightgowns, bras and underwear. Convenience: For this measurement, we judged controls and ergonomics, such as ease of loading and unloading, servicing the lint filter, whether the door could clear a tall basket, and whether the machine has a raised edge to contain spills. Noise: This score was determined by a panel of judges who listened while machines dried an 8-pound load, measuring both sound quality and volume. Results in the following chart are gathered from Consumer Reports’ 2018 Fall Survey of 41,424 electric dryers, owned by members who purchased a new machine between 2008 and 2018. Our predicted reliability ratings are based on a statistical model that estimates problem rates within the first 5 years of ownership, for clothes dryers that are not covered by an extended warranty or service contract. We also adjust for the median number of loads of laundry run through the machines per week. The median in our survey was 5 loads per week. Higher ratings are indicative of better reliability. Brands receiving a red or orange rating cannot be recommended by CR at this time. Our owner satisfaction ratings are based on the proportion of members who are extremely likely to recommend their clothes dryer to friends and family. Stainless-steel drum Stainless-steel drum A stainless-steel drum is likely to resist damage better than plastic and painted metal drums. Porcelain top Porcelain top A porcelain top resists scratching better than a painted one but generally adds to a dryer's cost. Painted tops, far more common, are often quite durable with normal use. Drying rack Drying rack The rack attaches inside the drum to keep items such as sneakers or sweaters from tumbling. Custom programs Custom programs This feature allows you to save your favorite settings. Steam option Steam option Generally, a water hook-up is required with this feature. In this cycle, a small amount of water is sprayed into the drum while tumbling with heat. It helps to reduce wrinkles and odors, but is intended only for a few garments at a time. Moisture sensor Moisture sensor Many dryers have moisture sensors that use electrical contacts in the drum to determine when laundry has reached the desired degree of dryness, whether that's damp-dry for ironing or ready to wear. Moisture sensors are more accurate than those using thermostats, sparing your laundry unnecessary drying and reducing your energy bills. End-of-cycle signal End-of-cycle signal Some models allow you to turn off the buzzer or bell or adjust the volume. Extended tumble Extended tumble This feature keeps the drum tumbling without heat after the drying cycle has ended, to prevent wrinkles from setting in. It's useful if you can't remove the clothes right after the cycle ends. It can be turned off in some models but not others. Door type Door type Some models have doors that drop down in front; others have side-opening doors (generally reversible) that may make it easier to access the inside of the drum. Stackable Stackable You can save space by placing the dryer on top of a suitable washer. Note that a special kit is sometimes required to mount the dryer on top of the washer. Dimensions (in.) Dimensions The exterior measurements of the dryer with the door closed, in inches (height x width x depth). Be sure to allow clearance in the rear for the vent duct. Warranty Warranty The length of time the dryer is covered by its manufacturer for defects or repairs. Controls Controls Rotary dial: The desired cycle and options are selected using dials. They are generally easy to understand and use. Push button: The desired cycle and options are selected by pressing in pushbuttons. Like rotary controls, these are easy to use and understand. Touchpad: The desired cycle and options are selected using an electronic touchpad which generally includes a digital readout. A touchpad can be more versatile than rotary and push button controls enabling you to program settings into memory, for instance. Touchscreen with display: The desired cycle and options are selected using an electronic touchscreen. A touchscreen can be more versatile than rotary, push button, and touchpad controls but it may be a bit more confusing, especially at first. Touchscreen controls can also provide step-by-step instructions, as well as feedback on cycle status. Touchscreen controls sometimes require you to page through several screens to choose options and features, which can be tedious. Lint filter location Lint filter location Top-mounted filters are generally easier to reach and clean. Filters located inside the door are less convenient. Remember to check and clean the filter before every load. Energy star Energy star The federal Energy Star program, administered by U.S. Environmental Protection Agency and the U.S. Department of Energy, identifies a wide range of home appliances that use 10-50% less energy than standard models. These appliances can help you use less energy at home and save money on your utility bills.